What’s the difference between the Eiffel Tower and the Washington Monument? Both structures soar to impressive heights, and each was the world’s tallest building when completed. But the Washington Monument is a massive stone structure, while the Eiffel Tower achieves similar strength using a lattice of steel beams and struts that is mostly open air, gaining its strength from the geometric arrangement of those elements. Now engineers at MIT and Lawrence Livermore National Laboratory (LLNL) have devised a way to translate that airy, yet remarkably strong, structure down to the microscale — designing a system that could be fabricated from a variety of materials, such as metals or polymers, and that may set new records for stiffness for a given weight. 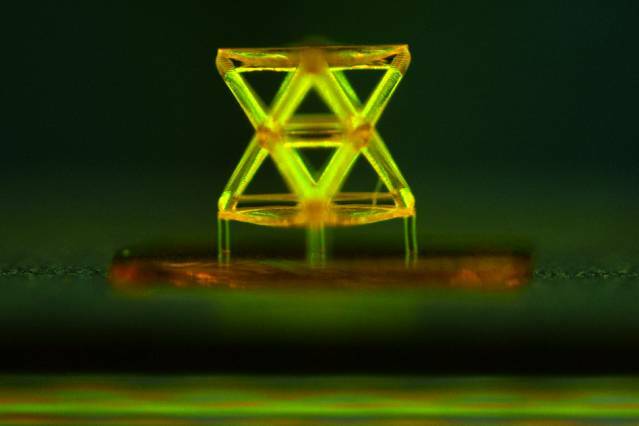 June 19, 2014 - New ultrastiff, ultralight material developed MIT NewsNanostructured material based on repeating microscopic units has record-breaking stiffness at low density. August 12, 2015 - Japan's 3D printed Privacy Visor will block facial recognition software for $240 3ders.orgThe National Institute of Informatics from Japan have used 3D printing to develop an interest set of privacy visors to block facial recognition software.